Active RS232 to RS422/RS485 Serial Converter Bidirectional Converter Adapter. 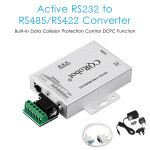 CQR1218 is a universal RS232 to RS485/RS422 bidirectional converter, designed to extend the RS232 transmission distance and the interface converter designed for the RS485/RS422 bus, which consists of a number of CQRobot independent innovation technology. It Includes built-in data collision protection control, the power supply and signal lights and inhibition of TVS transient voltages protection. In order to adapt to RS422 / RS485 with much bus wiring, it provides a terminal at port, DB9 and RJ45 physical interface, that effectively adapt to a variety of connection mode, making the bus from multiple directions to be better contacted and more convenient to be implemented. The equipment adopts the aluminum shell of sandblasting and anti-oxidation, which can effectively shield the external interference and have good heat dissipation. Point to point / 4 full duplex. Point to point/twine and half duplex. Point to multi-points/two-line and half duplex. To prevent the reflection and interference of the signal, a matching resistor is needed at the terminal of the line (the parameter is 120 ohm 1/4w) when the converter is used as full duplex or half duplex wiring. Built-in data collision protection control DCPC function. LED indicates power and signal status. The maximum support is 32 nodes. RS232 port protection: 15KV ESD. The RS485/RS422 port provides surge protection. With Lightning protection of 600W. 9V-18V / DC, Power Supply, With EU UK US Plug. It does not require a handshake signal to achieve transparent transmission. Working Voltage: 9V-18V / DC, Power Supply For RS232 to RS422/RS485 Serial Converter With EU UK US Plug. Interface characteristics: The interface is compatible with EIA/TIA's RS-232c, RS-485 / rs-422 standard. Electrical interface: Connector with RS-232 interface to input DB9; RS-422 / RS-485 interface: Terminal, RJ-45 and DB9. Protection level: RS-422, RS-485 interface with 600W lightning surge protection of each line. Working mode: Half-duplex asynchronous or full-duplex asynchronous. Signal indication: Three signal indicator light of power supply (PWR), send (TXD), receive (RXD). Transmission medium: Twisted pair or shielded wire. Transmission rate: 115.2k BPS to 300M/38.4 K BPS to 38.4 KM/9600 BPS to 5 km. Dimensions: 113mm * 55mm * 25mm. The using of environment: 25 Degree Celsius to 70 Degree Celsius, relative humidity of 5% to 95%. Transmission distance: 1200 m (115200bps-9600bps). 1 * DC 9V-18V Power Supply, With EU UK US Plug. 1 * RS232 to RS485/RS422 Convertor with Charger.